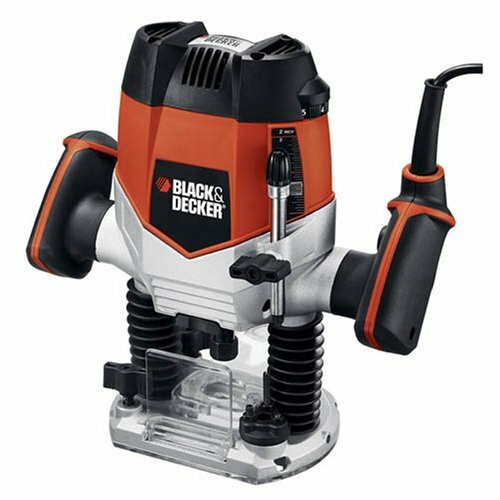 The Black & Decker RP250 is a wood router of its own kind that operates on a plunge base. It is ideally an entry level router with the ability to handle any function of the fixed base router. It comes with a 2-1/4 horsepower motor of 10 Amp that delivers the power of between 8000 to 27000 RPM. It is one of the best routers for cutting decorative edges and can work out excellently from the center of the wood surface. This router comes with numerous features that give it the ability to even “rout out” inlays. It features a soft-start that guarantees a safe and gradual start thus giving the user full control. 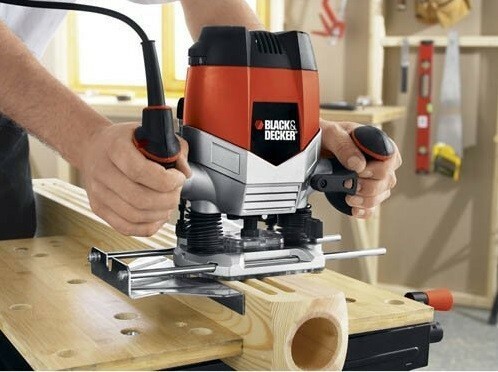 The impressive Black & Decker RP250 router has been superbly designed with a sight line base that facilitates visibility and ensures accurate results. The router comes with a ¼-inch collet as well as a spindle lock that enables the user to easily change bits when carrying out a variety of functions. Other key features that come with this router include an edge guide, 3 turret stops, a wrench, and many others. The router comes in a compact design and delivers impressive results in a variety of tasks. It is regarded as one of the most versatile woodworking tools. This router weighs 10.9 pounds and this makes it so much easy to handle since its light. It measures 11.5 x 6.6 x11.9 inches in dimension. It is a well-balanced router with an outstanding design and with its main colors being silver, red and black. The 10 Amp motor that comes with this router delivers superior power to rout out even the hardest wood types. With its 2-1/4 HP the motor boosts its variable speeds. The soft-start feature on the other hand, enables the user to increase speed little by little with respect to the type of project at hand. Once the woodworker is in control of the router speed, it is almost certain that they will get accurate results. The router has a smooth plunge action. It’s spring resistance is almost uniform from the start to its lowest point. This may be attributed to its two springs on each of its column sides. Unfortunately, you may not like the fact that the springs are installed on the outside and covered by a flimsy plastic boot. The boot may be great for keeping dust out but does little to improve the overall design outlook of the router. The plunge range of this router is excellent when compared to other routers. At full plunge its collet touches the piece of work and giving the router more than 2-inches in plunge depth. The router also has a plunge lock lever situated in the same position as that of other routers. However, it has a limitation – the lever is not spring loaded and thus the user has to pull on it so as to lock the router and has to push it back again to the other direction to unlock it. Black & Decker RP250 router comes with a pre-installed dust shroud that secures the bit above the table. Its shroud is made from clear plastic and it collects all dust to a built-in dust port. By connecting the router to a vacuum, you will be able to do a great job of collecting dust above its bit. The bit rotates within a tight chamber that makes an excellent dust collector. Furthermore, this router is capable of collecting dust produced below the table. In the absence of the shroud installed, a router ejects dust in all directions. The router comes with the clear plastic dust shield that protects the operator from dust. Beginners who may not be well-experienced in handling a router may find this feature useful but with professional, most of them will do away with it within a short time. This router comes with an edge guide. The guide may look a bit crude but it is well-designed. It is easy to install and it delivers as expected. It has the ability to cut parallel to the edge of the work piece more accurately and precisely. It is a fully-functional feature that adds value to this router. The Black & Decker RP250 router is ideal for the newbie. It may not be able to carry out some difficult tasks and thus may only be ideal for your home workshop and not commercial purposes. Nonetheless, this router performs exceptionally well when used with its ideal bits. It always delivers what is expected and even beyond. If you are a first-time router then this is a perfect choice for you. You can begin with this one then later graduate to more advanced and complicated router types.